It's like getting 5 cookbooks in 1! 172 reakfast Dishes, Muffins, and Breads 75 andwiches, Salads, and Soups 106 asta, Grain, Bean, and Vegetable Dishes 205 ain Courses 377 ookies, Cakes, Pies, and Other Desserts And Much More! Go gluten-free with ease! For the best all-purpose gluten-free cookbook, look no further. Inside, you'll find delicious gluten-free versions of foods you crave-including muffins, breads, pizzas, pastas, casseroles, cookies, bars, cakes, and pies. You'll also discover hundreds of recipes for all-American favorites, flavorful international dishes, and sophisticated special-occasion fare. It's everything you need to serve satisfying gluten-free meals 365 days a year! "This book has great recipes with a fresh healthy flair. Everyone should have this cookbook. I know mine will get tattered from use." 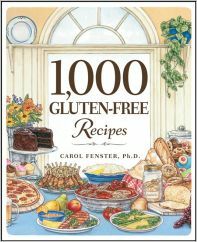 "Carol Fenster has combined simple, naturally gluten-free recipes along with those specially created for people with celiac disease. This is a comprehensive soup-to-nuts guide that any cook will use again and again." "The encyclopedia of gluten-free recipes has now arrived! What a wonderful assortment of healthy meals that even a gluten-free novice can tackle." Pancakes, Waffles, Eggs, and Breakfast Foods.